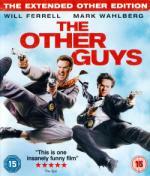 Overview: Misfit police detectives Gamble and Hoitz (Will Ferrell and Mark Wahlberg) are sentenced to life behind a desk. Forced to live in the shadows of the two biggest and most badass cops on the force (Samuel L. Jackson and Dwayne Johnson), they hate the monotony of their meaningless jobs almost as much as they hate each other. But opportunity knocks for Gamble and Hoitz when they stumble onto what could be one of the biggest crimes in years. Can The Other Guys step up their game and solve the case without killing each other and destroying New York in the process? Steve Coogan and Eva Mendes also star in this hilarious new comedy from the director of 'Step Brothers' and 'Talladega Nights: The Ballad of Ricky Bobby'. My Thoughts: I watched the extended edition and thought it was an OK film. I didn't really enjoy this as much as other Adam McKay films I have seen, the characters tended to grate on me. Maybe I wasn't in the right mood for this. Overview: Yashovardhan Raichand (Amitabh Bachchan) and his wife Nandini (Jaya Bachchan) have raised their sons, Rahul (Shah Rukh Khan) and Rohan (Hrithik Roshan) showering them with love and affection. Yash has tried to pass on to his sons the values, heritage and traditions of the family. Nandini has different dreams for her sons. Dreams of love that she wanted both her sons to experience, more so Rahul as she shares a special bond with him. A bond that has been cultivated with love for a child that was never meant to be ... a child who was adopted. Rahul's adoption was a secret never discussed in the Raichand household. Ever since Rahul found out at the age of 8 years, it became the reason for his unending gratitude for his parents - especially his father. His father's every wish became a command for him. A command which he never breaks until he falls in love with Anjali (Kajol) - a bubbly girl from Chandni Chowk, who dotes on her younger sister Pooja (Kareena Kapoor). Rahul marries Anjali and brings her home but his father doesn't approve of her. Rahul thus decides to leave home causing his mother's every waking moment to be spent eagerly awaiting his return. Seeing this the younger son Rohan makes a promise to reunite the family and bring back the happiness they once shared. 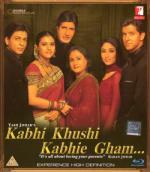 Kabhi Khushi Kabhie Gham (K3G) is directed by Karan Johar whose first film Kuch Kuch Hota Hai has so far been the highest grossing Indian film. Yash Johar and Karan Johar have assembled the largest star cast ever and created one of the most spectacular films of Indian cinema. K3G has in fact surpassed their own earlier film and is already the most successful Indian film of all time. My Thoughts: Another wonderful recommendation. A weepy again but with plenty of songs and dance. A father and son become estranged and the first half of the film details the where and when behind the estrangement whilst the second half shows how the younger son tries to bring about the family reconciliation. Overview: In the spirit of the Pirates Of The Caribbean trilogy, Walt Disney Pictures and Jerry Bruckheimer Films transport you to the mystical lands of Persia for this wildly entertaining, epic action-adventure. It's a race against time when a rogue prince (Jake Gyllenhaal) reluctantly teams up with a rival princess (Gemma Arterton) to safeguard a magical dagger that gives its possessor the power to reverse time and rule the world. Filled with death-defying escapes and unexpected twists at every turn — PRINCE OF PERSIA: THE SANDS OF TIME is a fun-filled adventure that will keep your pulse pounding long after the credits end. My Thoughts: An enjoyable romp. I guessed the bad bad guy early on in the film, part way through I started to wonder if I was right but was vindicated with my decision before the end. 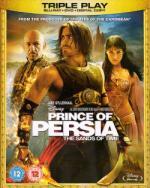 Having played one of the "Prince of Persia" platform games I could see how they incorporated some the games styling into this film and its action. Most of the time the brain was parked in neutral but a couple times I had to get into first gear but generally a good action romp. I believe a reference to the mascara wearing guy on the movie poster was made, at the time...by one of their pre-teen sons! Overview: Get set for wild action and sizzling chemistry with the exclusive extended edition of Knight and Day. Big screen superstars Tom Cruise (Mission Impossible, Tropic Thunder) and Cameron Diaz (Charlie's Angels, Something About Mary) come together in this thrilling action-adventure. When June meets a mysterious stranger on a routine flight, she thinks she's met the man who'll add some excitement to her life. But she soon discovers he's a fugitive super-spy, who thrusts her into a globetrotting cat-and-mouse chase. As the bullets and sparks fly, June must decide if she can really trust this Knight in shining armour. 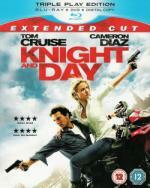 This triple play edition of Knight and Day contains a Blu-ray, a DVD and a Digital Copy — for you to enjoy when you want, where you want! My Thoughts: I watched the Extended Cut and thought it was a fairly standard action-adventure, comedy film. It was moderately fun and a slightly enjoyable no-brainer. Overview: From Sanjay Leela Bhansali, one of India's most acclaimed cinema directors comes a love story. 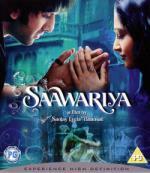 Saawariya is a tender and romantic musical which centres around the chance encounter of two people Raj (Ranbir Kapoor) and Sakina (Sonam Kapoor) and an impromptu romance that's initiated in the remote picturesque town of Simla, a quaint hill station in Northern India. My Thoughts: This film is based on the story "White Nights" by Fyodor Dostoevsky, not a work or author that I have ever read therefore I cannot compare them. The film is set in a red-light district and Gulab (Rani Mukherjee), one of the women who work there, relates a story that takes place over four or five nights. A wandering musician, Raj (Ranbir Kapoor), arrives in town and meets a young woman, Sakina (Sonam Kapoor), crying on a bridge. She is pining for her love, Imaan (Salman Khan), to return from whence he had wandered. The tale is about unrequited and requited love and although I guessed part of the ending I didn't expect the final outcome. Overview: Steven Shorter, the biggest pop star of his day, is loved by millions, his endorsement influencing the actions of the masses. But, in reality, he is a puppet whose popularity is carefully managed by government-backed handlers keen to keep the country's youth under control. Starring Manfred Mann lead singer Paul Jones and iconic Sixties supermodel Jean Shrimpton, Privilege is remastered in High Definition and made available in the UK for the first time since its original cinema release. My Thoughts: A film I remember seeing in the '60s but not too much about. The lead role of Steven Shorter, a pop star adored by the masses, is played by Paul Jones who had been the voice and front man of the pop group Manfred Mann. The film is made as a pseudo-documentary set in the near future, then of the 1970s. Steven is heavily contolled by his management team who in turn are sponsored by various government departments who believe that contolling Steven Shorter allows them to control the teenage mass. Parallels with this film can probably be drawn today with they way that media, in all forms but especially the populist press, seem to have the power to make or break people with relative ease. Overview: When the body of a female tramp is found in the park, her nephew, Shou, is called upon to clean out her abandoned apartment. He unwittingly embarks on a surprising journey through the extraordinary life of his aunt, Matsuko, a starry-eyed female searching for her prince. A collision of visually stunning hues and Bob Fosse-like musical set-pieces, this Amelie-esque fairytale gracefully glides through the decades from the 50s to the 80s. Miki Nakatani displays an award winning performance as Matsuko, engaging the audience with her touching portrayal of life. My Thoughts: An interesting film. Sho (Eita) is ask to clear out the apartment belonging to his recently deceased aunt Matsuko (Miki Nakatani), an aunt he never knew he had. In clearing the rubbish he comes across items from her past and meets some of her acquaintances. This leads him to discover details about her life where she appeared to stumble from one disastrous relationship to another. One very nice misty-eyed touch was the ending which recalled a line much earlier in the film. No problemo, I hope you like it as well. Overview: For Naina Catherine Kapur (Preity Zinta), life is cold, grey and dull - as it has been ever since a family tragedy shook her world. Between the constant bickering in her half punjabi half Catholic household, her grandmother's temper, looking after her little sister and brother and helping her mother (Jaya Bachchan) deal with the family's financial troubles - Naina has no time for things like parties, fun or herself... she's twenty-three, going on fifty. she is serious. She is boring. Aman pushes Naina into doing things she would never dream of doing. He nags her till she learns to smile. He conspires with friend Rohit (Saif Ali Khan), an eligible Manhattan bachelor to help find her happiness. Kal Ho Naa Ho is the story of Aman, Rohit and Naina's journey together - how they discover themselves, find the courage to love and come together to celebrate life. My Thoughts: Yet again another wonderful recommendation. This must be the one weepy to rule all other weepies. The first half of the film builds the characters and their dynamics leading to a little weepy session before the intermission. Then the second half is powerful with many weepy hits all through it leading to its conclusion and small postscript set 20 years later. Overall this is not just a weepy though, this film has a very strong multi-threaded story being told with some unexpected reveals. p.s. I loved the Bollywoodized interpretation of Roy Orbison's "Pretty Woman". Let me know if you need further Bollywood recommendations. I think I know of a few others you might enjoy. Thanks Tom, for all the recommendations. I have quite a few Bollywood in my TBW pile but may well come back to you. Although to counter this I have to say that I have watched more, apparently 15 so far. So 28 individual titles since June when I started with Black although the count of owned is higher at 31 because I double dipped on 3 DVD's so far for Blu's with a further one due to be despatched next week and I haven't removed the old copies from my DVDP. I may well also be ordering Kites after your mention of it earlier. Overview: In a happy suburban neighbourhood with its well-kept gardens and white picket fences, sits a black house with a dead lawn! This is the secret hideout of Gru (Steve Carell), who, with his army of excitable little yellow minions, plans to TAKE OVER THE WORLD. Armed with his arsenal of shrink rays, freeze guns and battle-ready vehicles for land and air, Gru is accustomed to defeating all who stand in his way. But the arrival of three little orphaned girls, and their determination to make him their Dad, threatens his reputation as a SUPER-VILLIAN! My Thoughts: Evil super-villain Gru (Steve Carell) adopts three orphan girls in a quest to beat his latest rival Vector (Jason Segel). 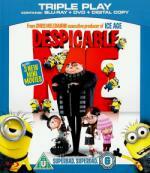 Fairly usual fun and frolics in this animated film. 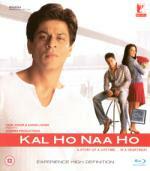 Overview: The makers of 'Main Hoon Na' are back with the biggst film of 2007! Farah Khan, one of the most accomplished directors in India, weaves a spectacular story of romance, revenge and reincarnation. 'Om Shanti Om' is a romantic saga of a boy next door, Om Prakash Makhija (Shah Rukh Khan) who works as a junior artiste in bollywood in the 70's. He is madly in love with the superstar of that time, Shantipriya (Deepika Padukone). His dreams and aspirations to become a superstar and be with his lady love are thwarted as he witnesses the brutal murder of his beloved Shantipriya by a mercenary producer Mukesh Mehra (Arjun Rampal). Om Prakash dies, trying to save his Shanti. But destiny has something else in store when 'Om Prakash' a junior artiste returns as 'Om Kapoor' the superstar of 2007! His journey of rediscovering himself, his past life and avenging the death of his beloved is the story of 'Om Shanti Om! My Thoughts: I quite enjoyed this film. Many of the references to Bollywood old and new were lost on me with my current lack of depth of knowledge about Bollywood but that didn't detract from the overall enjoyment. The big climatic song at the end for the final reveal reminded me very much of Sir Andrew Lloyd Webber's "The Phantom of the Opera"